On the bottom of the worksheet there is a brief activity for pronunciation. When I used this worksheet, I had my students put their hands on their throats and make a sound (eg. v vs. f, b vs. p, g vs. k, etc). If it was "voiced," their vocal chords vibrate and if it's "unvoiced," their vocal chords do not vibrate. I had them make different sounds and tell if it was voiced or unvoiced and then look at the rule on the page to determine how a word would be pronounced. Then we went through the list of provided words to determine each word's particular pronunciation. This helped them to understand the meaning of "voiced" versus "unvoiced" and to be more active in the learning process. I've found that "ed" pronunciation can be very challenging for non-native speakers. So, it's crucial to make sure they understand why it's pronounced differently in different words. I hope this is useful to you! Have fun and good luck! The above downloadable teaching material is best suited for high school students, elementary school students and adults at Elementary (A1), Pre-intermediate (A2), Intermediate (B1) and Upper-intermediate (B2) level. 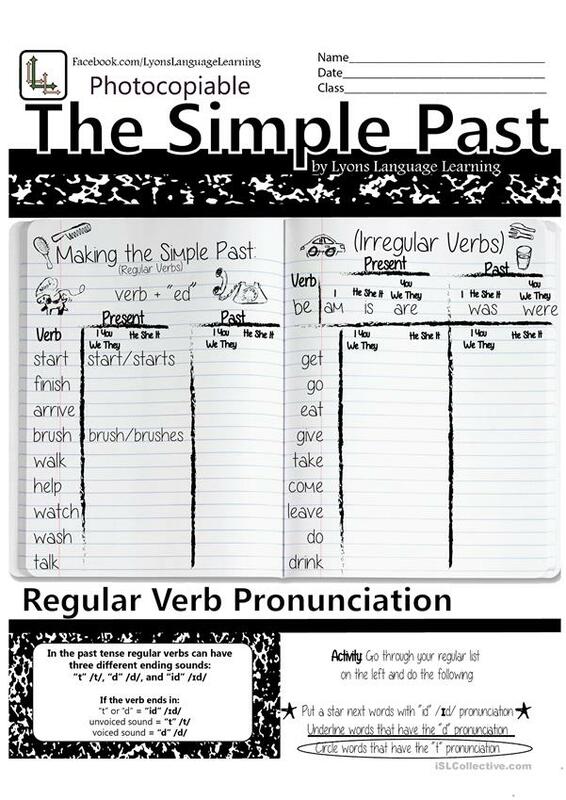 It is valuable for revising Past simple tense in English. LyonsLangLearning is from/lives in United States and has been a member of iSLCollective since 2014-05-16 06:59:11. LyonsLangLearning last logged in on 2014-06-21 19:52:56, and has shared 2 resources on iSLCollective so far.